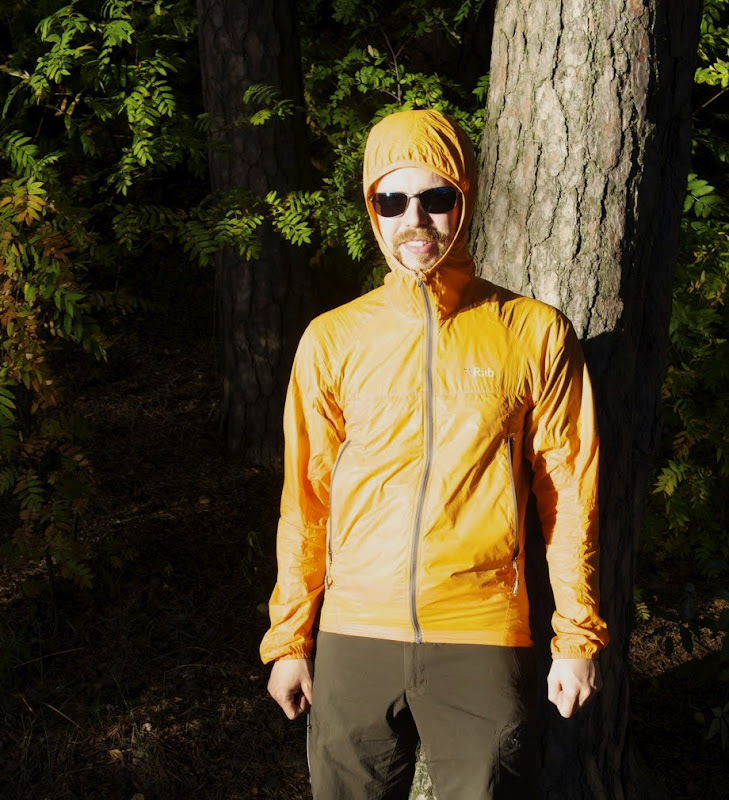 Windshirts are one of the epitome of lightweight & ultralight backpackers, though increasingly traditional outdoor folks start to see the benefits of a wind jacket. The Rab Cirrus Wind Top came out in 2010 and is made of Pertex Quantum 15D mini ripstop, has a full size zipper, two big mesh hand pockets and a hood, and after a few months of usage it is time to let you know how I like it. Rab sent me the Cirrus Wind Top in May this year, and I've been sporting it since it during week-long expeditions, day trips, overnighters, mountain biking, travelling, working as a Guide, and in the city. So far no wear and tear on it, and I have used the jacket a lot when going grocery shopping (think 8+ kg of groceries being carried). Also some bushwacking was no problem for the jacket, so I think it will be going strong for many more months (hopefully years!). I reckon spring, summer and autumn are the optimal seasons for this garment, though I will try it out also in winter when skiing and snowshoeing. Update 20.03.2012: I have now used it various times in winter for skiing, where it performed very well. I took it down in low double digits temperatures (max -15°C) on sunny days with some wind, and it was working very well in those conditions. In strong wind on cloudy, colder days I would prefer the extra warmth of a hardshell, too for spring skiing and mild midwinter days nothing speaks against saving some weight and using this windjacket. A wind jacket should keep the wind out, and possibly a bit of rain. The Pertex material is fascinating, it is thin like baking paper yet it doesn't let any wind through, and even in a drizzle it is sufficient to keep you dry. If it rains a lot, the material is wetting through (or that is how it felt as I was wearing a T-Shirt under it). 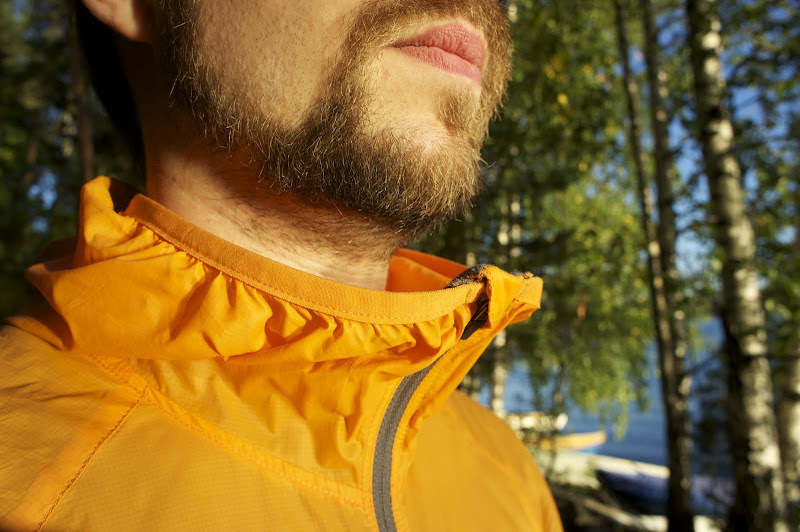 As Tampere is the "Windy City" of Finland a wind jacket is a useful garment in the wardrobe, and the Cirrus was very often the wind jacket of choice for any walk or trip. Small enough to fit in my pant's cargo pocket, it is easy to store, and you also can just turn one of the mesh pockets inside out and stuff the jacket in there. It is soft and comfortable on the skin, fine if you just wear a short sleeved shirt under it and need a light jacket to keep the wind out/ the bugs off. If you are only wearing a T-Shirt under your wind jacket though, you might get a little cold when the wind pushes the material against your skin. If it is warm & sunny, the material starts to feel a bit clammy in high exertion activities - best to pack it away then, and enjoy the warm weather! An "Under the Helmet hood" which works very nice, the elasticized hood sits snug around your face and protects your ears and the rest of the head from wind. The two mesh handpockets are good - set a bit higher so you can wear it with a harness. The pockets are easy to open with one hand, even with a gloves on; super roomy, you can store plenty of stuff in them. The hem has a drawcord which works better than many drawcords in hems I have used, a pull with one hand is all that's needed. The hem stays about average time down - as usually, after some time it wanders up. The elasticated cuffs function well to keep the wind out of your arms and not make them look like monster sausage arms.The front zipper works smooth, though the slider is tiny and I would recommend adding a short piece of string to make it easier to pull up/ down with one hand. The zipper even has an internal storm flap and at the top on the inside there's a little piece of fleece for extra comfort against your chin or beard. Possibly the usage of Pertex Quantum as a fabric material. Making a jacket with a full zipper and two hand pockets and a hood for 112 gram is quite a nice achievement, too. The jacket is made in China, and the quality is topnotch. All seams are clean, there are minimal small ends of thread standing over at some seams, the zippers run smooth and the size is good. Minor bushwacking was no problem for the jacket, as was carrying 8+ kg of groceries in a backpack two to three times a week for four plus months. The original weight of my Size S was 112 gram, though after taking out the labels and cutting of the buckle to roll up the hood I brought it down to 109 gram. Not bad at all considering all the features it sports. Rab addresses on it website sustainability issues, which is a step into the right direction. They invite their customers and interested parties to communicate with them via Email if they have questions, and the designers proclaim to work hard on finding ways of balancing longevity, sustainability and affordability. Digging a bit deeper (I haven't written them, might do that in the future) I fail to find information on possible Environmental Management Systems, working together with organizations which want to make the supply chain more sustainable (e.g. using recycled materials/ Cradle-to-Cradle thinking) or if they contribute to nature conservation organisations. 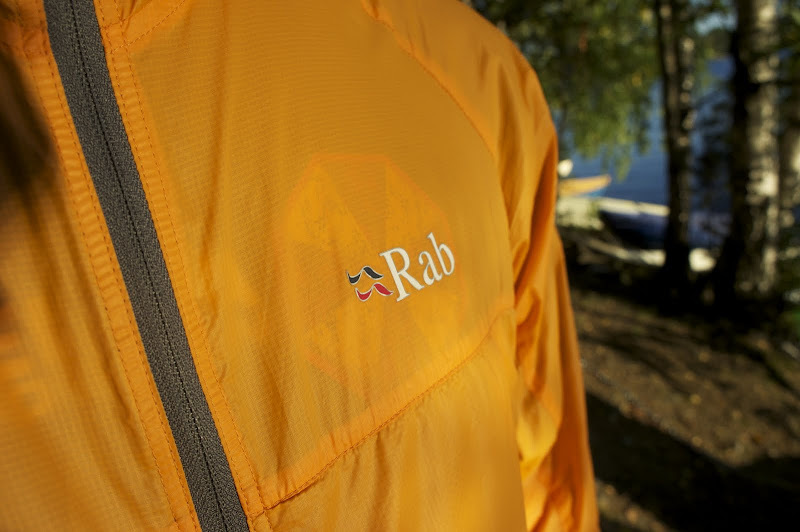 However, Rab being a UK company, and the UK legislation requiring more and more such considerations, plus Rab itself needing the outdoors to continue to exist I am certain we will see more positive developments in that direction. Being made of Pertex Quantum I checked the Pertex website, and sure enough they have a short blurb on Ecological considerations, proclaiming the usual stuff. Recycling wise I would probably try to sneak it into the Patagonia Common Threads programme at the end of its life, or before that pass it on to someone. The Cirrus being made in China, I also would welcome some information on labour standards in the factories which produce the garments. I am certain Rab has very carefully chosen its suppliers in China (ensuring no child labour, fair wages, decent working hours, safe working environment, etc. ), though for concerned consumers it might be worth to communicate these factors on the website. 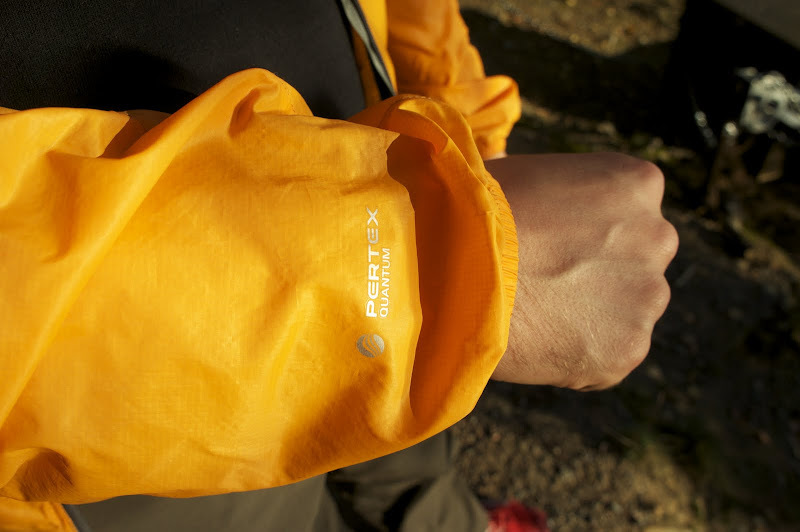 The Montane Lite-Speed jacket (Claimed 175 g/ Size L) is the Cirrus' closest rival, being also made of Pertex. The Arc'teryx Squamish Hoody (141 g/ Size S; own weight) is made of an other material, has no hand pockets but has a hood with a good visor. The Patagonia Houdini Jacket (Claimed 122 g/ unknown Size) is a fairly popular windjacket, and the Norrona bitihorn aero60 Jacket (Claimed 187 g/ unknown Size) is the newest kid on the full-zipper & hood windjacket market, and has speaking for it that it is made of recycled materials. James has reviewed the Rab Cirrus Pull-on and found it a fine piece of kit, though it shows some wear and tear from the long use in the hills. Also Peter has had the Cirrus Pull-On for months on test and liked it. A 109 gram full zip jacket which keeps the wind out and keeps you reasonably dry in a drizzle. I can wear it over two baselayers (like a thin hoody and a T-Shirt) and an insulation layer, though also just over a T-Shirt it is a good, tight fit. I love the orange colour, it certainly adds a nice touch to the outdoor wardrobe (which consist for me usually of black). I value it a lot, and during the summer I rarely packed anything else than the Cirrus and an umbrella to keep wind and rain at bay. 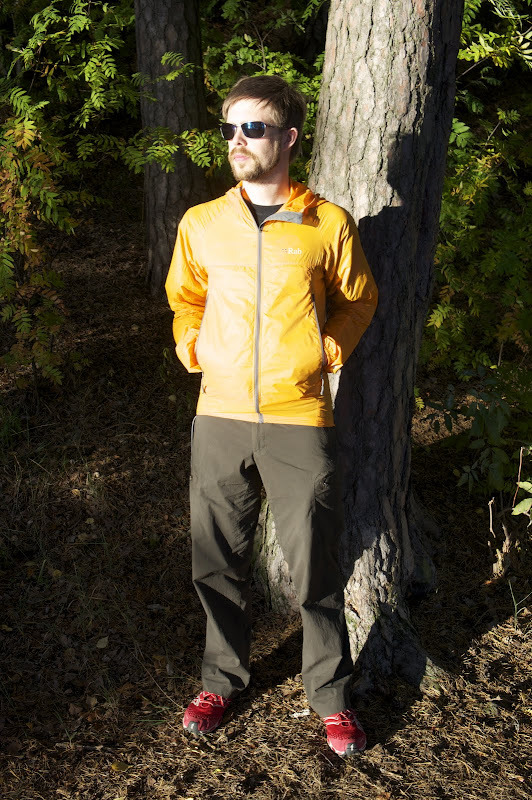 If you're not yet a convert to wind jackets, then I recommend you check out the Rab Cirrus Wind Top and try it yourself. I found it at Webtogs for £54 and at Ultralight Outdoor Gear in the UK for £55. Other usual suspects don't seem to have it in stock at the moment.